When a number of UFOs violated Washington airspace in 1952, the entire country went on alert and the news spread nationwide. Shortly after the incident, President Harry Truman was forced to hold a press conference to address the event. After that conference, as well as the big UFO wave proceeding the atomic bomb, the subject was engulfed in secrecy. Today, it’s a different story. A number of governments and government agencies, as well as thousands of Freedom of Information Act (FOIA) requests, have all released previously classified files confirming the existence of UFOs. To compliment these, hundreds (if not thousands) of high-ranking whistleblowers have also shared their stories. The topic is currently leaving the realm of the fringe and entering into the mainstream at a rapid pace. Just as there was evidence for UFOs, there is also evidence that some of them are indeed extraterrestrial in origin. This is all becoming normalized, and more and more people are starting to open their mind to the possibility, and evidence, that the government (and those who puppet it) is withholding information about intelligent extraterrestrial visitation to our planet. Exactly the same charge has been made by Admiral Delmar Fahrney, former director of the naval guided missile research program, and by R.M., Hillenkoetter, former chief of the Central Intelligence Agency. . . . If Jung were the only responsible person to make such charges, we could brush the whole thing off as nonsense. However, when a number of pilots, radar operators and other trained observers agree that UFOs are real, a serious reappraisal of the situation is in order. It’s not anywhere near as significant as all of the other documentation and information that’s out there pertaining to the UFO subject, but nevertheless stands as another great example of how the CIA has been keeping tabs on the phenomenon. To learn more about other aspects of this phenomenon, you can sift through the exopolitics section of our website. 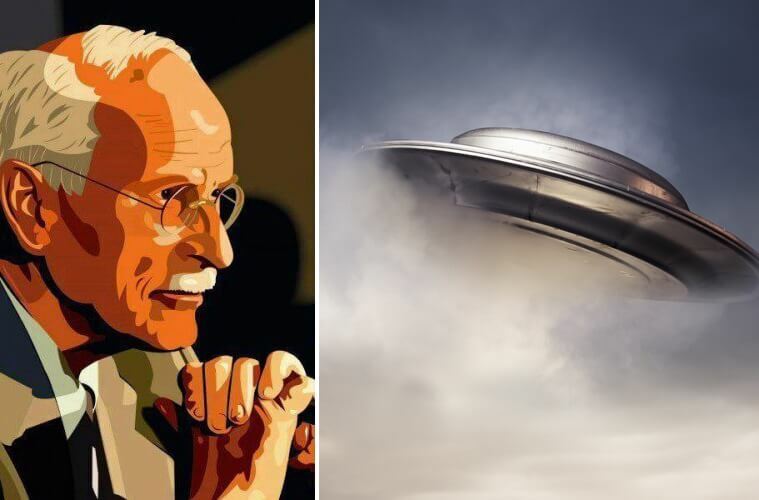 This document clearly states, and further validates the many who have also argued, that Jung really believed in this phenomenon and supported the extraterrestrial hypothesis as a possible explanation for the existence of UFOs. He even wrote a book about the subject titled Flying Saucers: A Modern Myth of Things Seen in the Sky where he speculates about their nature, approaching the subject from a psychological rather than personal standpoint. What astonishes me the most is that the American Air Force, despite all the information in its possession and its so-called fear of creating panic, seems o work systematically to do that very thing (witness the Orson Welles radio play at New Jersey) since it has never yet published an authentic and certain account of the facts, only occasionally allowing information to be dragged out of it by journalists. I also found a link to these quotes from this Princeton blog post. It’s quite amazing to see just how many ‘credible’ people have been speaking up about this topic after examining the evidence, for decades, and now we know that this long list includes Carl Jung.